Not to be confused with the similarly-named Jawz. 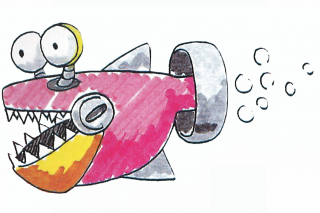 JawsMedia:Sonic1 MD US SonicJam manual.pdf, called Puku-puku (プクプク) in the Japanese manualMedia:Sonic1 MD JP manual.pdf, which is a Japanese onomatopoeia for a bubbling noise, is a piranha Badnik found in the waters of Labyrinth Zone in Sonic the Hedgehog. They simply swim around back and forth slowly. Since they have no kind of protection, they can be easily destroyed by jumping. Jaws makes a return in both versions of Sonic Lost World. In the Wii U/PC versions, they are exclusively found in the underwater areas of Tropical Coast Zone 1 where they are relatively harmless and easy to dispose of with the Yellow Drill. In the Nintendo 3DS version, they are found in the underwater pools of Tropical Coast Zone 1 and 2, either swimming about in groups or deployed by Blowfish Transporters. If they spot Sonic, they will chase after him and try to bite him. Jaws in Sonic the Hedgehog (16-bit). Jaws in Sonic the Hedgehog (8-bit). Jaws in Sonic the Hedgehog 4. This page was last edited on 28 September 2018, at 15:31.